April 23rd 2016 . . . St George’s Day, Earth Day, the 400th anniversary of Shakespeare’s death . . . and, most importantly of course, the day we held our latest volunteer social! 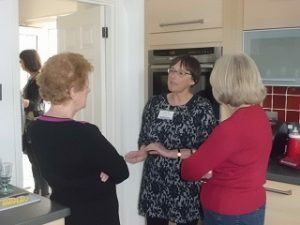 This time we met at volunteer Val’s home near Hemel Hempstead, the weather was kind to us, and we all enjoyed a lovely sociable afternoon catching up with old friends and meeting new ones. There was a good mix of previous volunteers who could tell us about their placements in a variety of different countries and potential volunteers who wanted to find out all about how people and places works and were keen to learn more about the places where they might volunteer soon. We try to find venues for our socials in different parts of the country to give everyone the chance now and then to come to a social not too far from home, but some volunteers had made the effort to travel quite a long way to this one, and we must make special mention of the new volunteer who flew in all the way from Donegal! It is interesting that at some socials the focus seems to be, quite by chance, on the projects in just one or two of the countries where we volunteer. At last November’s social there happened to be a lot of volunteers who had either just returned from or were just about to go to South Africa, and our different projects there dominated the conversation. This time the flavour of the month was definitely Cambodia, with new volunteers in particular wanting to know all about the volunteering opportunities there. They will of course need to go through the matching process to make sure their skills and experience match the needs of the projects there, but it certainly looks as though Cambodia can expect several new people and places volunteers later this year! You can read more about our volunteering opportunities in Cambodia by clicking here and here. Thank you once again to Val for hosting this social in her lovely home – we hope your family enjoyed eating up the left-over food! Our socials are always such an enjoyable way to catch up with each other’s news, and we hope to see many of you again at our next social later in the year. Watch volunteer Robert talk about why and how he has chosen to volunteer with people and places and how important the volunteer social was in this decision.